HP Compaq 6000 Pro All-in-One 3.5" Hard Drive Caddy Bracket- 3BZN6HBTP00. 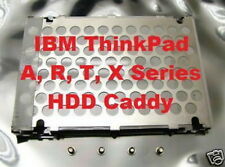 NEW HP ELITEBOOK 6930P LAPTOP HARD DRIVE CADDY DOOR COVER. 1 DOOR COVER. 5 pcs NEW HP NC6110 NC6120 NC6130 NX6110 NX6120 HDD Hard Disk Drive Cover Door. NC6110 NC6120 NC6130 NX6110 NX6120. 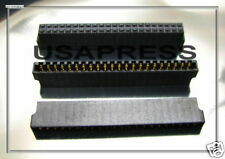 Can be used for Blank out or to mount extra ide or Sata hard drive. Compaq Models Lot of 1 HP Harddrive Hard Drive Connector Adapter. 1 pcs Harddrive Connector. ze4414AP, ze4415EA, ze4416AP, ze4417EA, ze4420CA, ze4430US, ze4455EA. ze4403EA, ze4404EA, ze4407EA, ze4410AK, ze4410AP, ze4410CA, ze4410EA. Connector / adapter f or HP DL140 / DL145 G2 IDE slim optical drive. IDE interface. A slim line laptop IDE/PATA/ATA Adapter. It converts laptop 12.7mm CD-ROM DVD-ROM CD-R/RW Combo DVD-R/RW and BD (Blu-Ray) IDE/PATA/ATA. One HP Pavilion DV7 DV7-4000 Bluray player DVDRW burner with Silver Black faceplate bezel 605417-001. SATA Drive. Drive Model: TS-TB23L or TS-LB23L. For P/N 605417-001 DV7-4065DX P/N 3KLX910. Here is a hard drive caddy Cage Bracket for use with Compaq Presario M2000, V2000, HP Pavilion dv1000 and ze2000 series laptop computers. Compaq Presario M2000. They work very hard to get quality products to you quickly. HP Compaq 9.5mm MultiBay II Drive USB Cradle. 1x Connector, 1x side strip, 4 screws. For CD-ROM, DVD-ROM, Combo, DVD Burner optical drive support. Picture is for reference. Drive is not included. Standard Notice. The Compaq Presario 1800t Hard Drive Caddy w/screws has been graded A. This item is 100% tested, functional, and in very good condition. Robot Vacuum Parts. Used Robot Vacuums. Fans - Cooling Fans. Hard Drive Caddys. N3000 N3100 N3110 N3150 N3190 N3200 N3210 N3215 N3250. HP Pavilion. HP Omnibook. N3270 N3290 N3295 N3310 N3330 N3350 N3370 N3380 N3390. 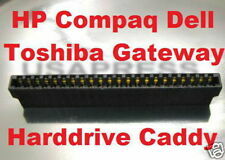 The Compaq Presario CQ35 Hard Drive Caddy W/screws has been graded A. This item is 100% tested, functional, and in very good condition. Robot Vacuum Parts. Used Robot Vacuums. Fans - Cooling Fans. Hard Drive Caddys. One piece of DVD or DVD RW mounting clip Fits all 12.7mm thickness drives. COMPAQ HP NC4010. Hard Drive Caddy for Compaq HP. One Genuine HP Pavilion DV7-1000 Silver Black DVD/CD faceplate bezel HP part# applies to: 480459-001 480459-002 Like new. Very clean. Will Fit 2.5" IDE Laptop Harddrive, Any Capacity. Presario 2200 Series. Presario 2100 Series. Presario 2500 Series. 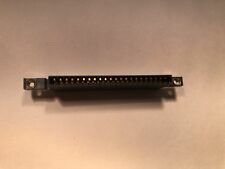 Compaq Models Lot of 1 HP Harddrive Hard Drive Connector Adapter. 1 pcs Harddrive Connector. 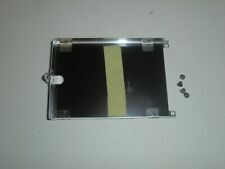 The Compaq Presario M2000 Hard Drive Caddy W/screws has been graded A. This item is 100% tested, functional, and in very good condition. Robot Vacuum Parts. Used Robot Vacuums. Fans - Cooling Fans. Hard Drive Caddys. RoHS compliant Slim line laptop IDE to USB Adapter. Converts any laptop 12.7mm CD-ROM DVD-ROM CD-R/RW Combo DVD-R/RW and BD (Blu-Ray) IDE to USB interface. With power through USB technology. IDE interface. One new Genuine HP Pavilion DV7-2000 DV7-3000 Silver Black DVD/CD faceplate bezel with bluray logo as picture. (part number stamped on bottom of this piece). ONE ITEM IS INCLUDED IN THIS SALE PLUS THE FOUR SCREWS THAT SECURE CADDY TO MOTHERBOARD AS SHOWN IN ITEM PICTURE. THIS SUPER HANDY 116 page PDF GUIDE WILL ASSIST YOU NOW OR LATER IN MAKING REPAIRS TO YOUR HP PAVILION N5xxx SERIES LAPTOP, OMNIBOOK OR XE3 LAPTOP. COMPAQ HP NC4000. 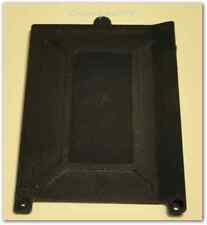 Hard Drive Caddy for Compaq HP Specifications Hard Drive Caddy for Compaq HP. Compaq Armada. Compaq Evo. One Hard Drive Caddy is included. Will Fit 2.5" IDE Laptop Harddrive, Any Capacity. HP Presario. HP Prosignia. One piece of DVD or DVD RW with or without Lightscribe logo bezel for the followings drives This is face bezel only. Drive is not included. Face bezel only. May not have 'Lighscribe' logo. One DVDRW face BEZEL (New). 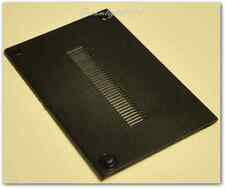 The Compaq Presario Z500 Hard Drive Caddy W/screws has been graded A. This item is 100% tested, functional, and in very good condition. Robot Vacuum Parts. Used Robot Vacuums. Fans - Cooling Fans. Hard Drive Caddys. USB 2.0 to SATA IDE adapter. USB2.0 Slim Optical Drive. USB2.0 Slim Portable Optical Drive Case. Laptop Floppy Drive. Includes: 1 IDE Hard Drive Connectors. SD RAM, PC 100, PC133. For CPU Cooling. Notebook Cooling Pad. HP Ultra SCSI caddies for 3.5" drives. Clean pulls in good working order. Compaq/HP part number 189395-001. USB 2.0 to SATA IDE adapter. Includes: 1 IDE Hard Drive Connectors. USB Serial Ports. USB2.0 Slim Optical Drive. USB2.0 Slim Portable Optical Drive Case. Laptop Floppy Drive. SD RAM, PC 100, PC133. For CPU Cooling. The Compaq 610 Series Hard Drive Caddy has been graded A. This item is 100% tested, functional, and in very good condition. Robot Vacuum Parts. Used Robot Vacuums. Fans - Cooling Fans. Hard Drive Caddys.